If it isn’t already apparent, I’m a huge fan of small scale, independent bakeries/ cafes that churn out their own stuff. Drips falls into this category. Tarts, and other things like their butter cake are all made from scratch in their kitchen. Business was bustling on the Sunday we went and the tarts were quickly being snapped up. 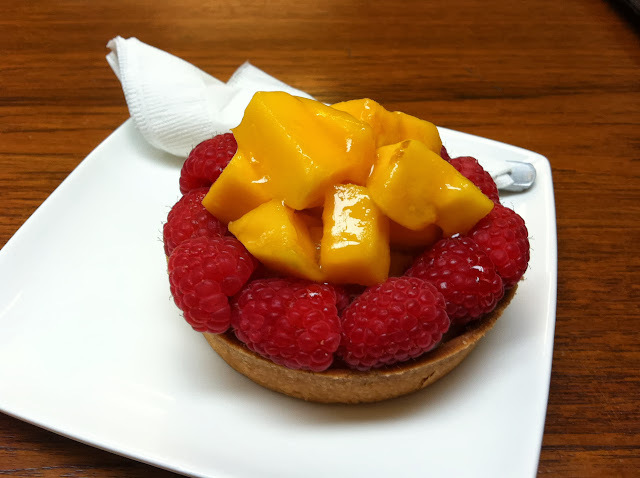 Even before the friend got a table I was already at the counter buying the last fruit tart available. Simple as it was, the fruit tart was delicious. Crunchy, buttery tart base filled with luscious not-too-sweet custard and topped with fresh fruit. The flavours aren’t surprising (if you are looking for interesting flavours maybe Windowsill Pies would be a better option. For strong flavours do try Carpenter & Cook’s passion fruit/ lemon/ dark chocolate salty caramel tart) but if you are craving for a classic fruit tart, this is one of the better ones around.